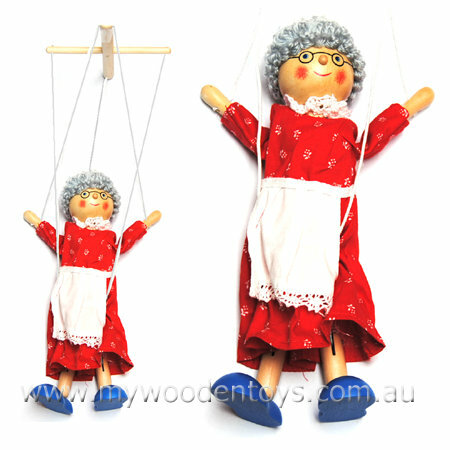 Beautifully made with jointed knees and hips Grandma is stable and easy to use. With lovely rosy cheeks a happy smile and grey hair it is easy to get her walking on her nice blue shoes. Grandma has 5 strings, 1 for the head, 2 for arms and 2 for legs. She even has a pair of round painted on glasses. Material: Wood, Child-safe paint, Cotton. We like this because: "A beautiful traditional toy at a very reasonable price"